What happens when you read Susan Cleveland’s new book Piping Hot Curves and have my Twisted Sisters block on your mind? PIPING HOT TWISTED SISTERS! 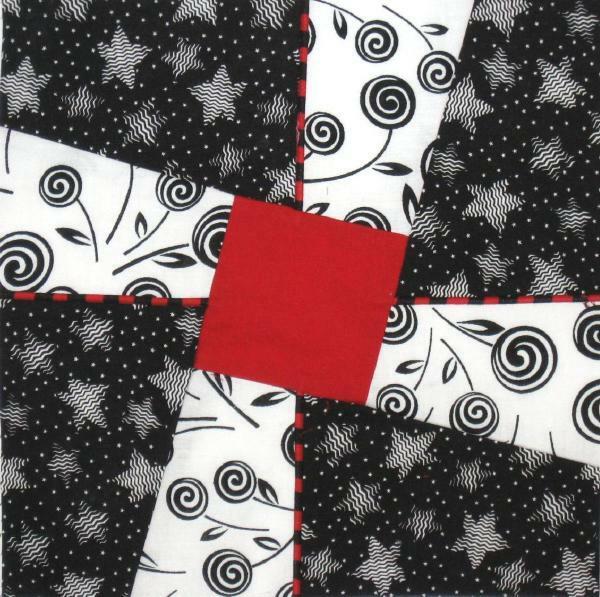 Check out the subtle black and red striped corded piping in between the twists and the background of this block. Sweet, huh? I’d recommend a narrow (1/2″ finished) sashing between blocks, otherwise the bulk of the cording might be problematic when you press. You would still be able to slide and lock the intersection at the middle of each block, but flattening the seam allowances would be the issue. What do you need to make your own version of this cool combination? Twisted Sisters Rotary Template & Pattern and Susan Cleveland’s Piping Hot Binding Tool. Want to be inspired by Susan’s clever book? Buy Susan’s Piping Hot Curves. That is way cool, Ami! Shouldn’t that block be quilted and bound and become an Priority Quilt Little Treasure? What a cool idea! Piping can add depth and texture to selvage quilts, too! I’m going to try this. Ooooooooo! And I have both those books. Now I really should get that piping tool and then I’d be all set to try that. I’ve done several of the Twisted Sisters crib quilts to give away for gifts. Now something else for me to try. Yay! !